full-sheet (22" x 30") to canvases 60" x 72." Mr. Schink hold a B.A. degree in Fine Arts from Stanford University and has studied privately with Rex Brandt, Edward Betts, and Barse Miller. Schink is an elected member of the National Watercolor Society and an Honorary Member of the Federation of Canadian Artists. Schink's paintings have been included in numerous national and international exhibitions including Watercolor USA, The National Watercolor Society Annuals, and Watercolor West. 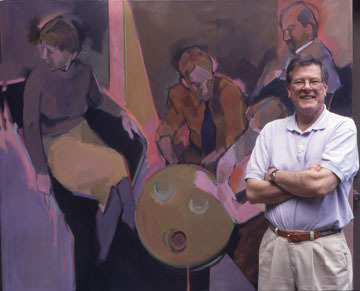 He has exhibited at one- and two-man shows at The Asheville, NC Museum, The Columbia, SC Museum, and The Jackson, MS Municipal Art Gallery. His paintings are in many private and corporate collections. Mr. Schink has conducted workshops in 45 states in the U.S. as well as classes in Canada, Mexico, Australia, and Europe. He has served as juror for over 40 state, regional, national, and international exhibitions. Schink is the author of several popular books and the co-editor of the quarterly publication The Palette Magazine. His work has been featured in many books and magazines including The American Artist, The Artists' Magazine, and International Artist. Schink has been featured in numerous magazine articles including American Artist Magazine, The Artist’s Magazine, and International Artist and has contributed instructional articles to these and other publications. 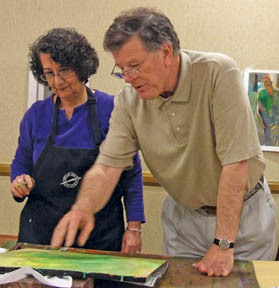 He is also a popular juror, who has judged more than 35 national, regional, and state exhibitions.